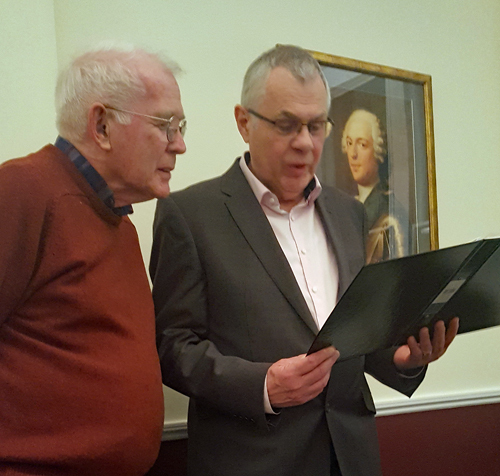 Graham Whiteley (right) with John Webster. In 1945 Germany unconditionally surrendered, and the Yalta and Potsdam conferences the Allied Powers agreed to divide the country into four Zones of Occupation. Whereas the US, France and the UK supported economic and social revival in what was to become the Federal Republic or West Germany, the Soviet Union exacted massive reparations creating widespread poverty in the East. In 1948 the West introduced the Deutschmark, regarded by the Soviets as a breach of the Potsdam agreement so they ended cooperation and subsequently introduced the Ostmark, in the following year formally establishing the German Democratic Republic recognised by only the Communist bloc and some left-wing African countries. The Socialist Unity Party of Germany became the ruling party in a regime where the Ministry for State Security commonly known as the Stasi was the official state security service. One of its main tasks was spying on the population, mainly through a vast network of citizens turned informants, and it fought any opposition by overt and covert measures including hidden psychological destruction of dissidents. In 1961 the Berlin Wall was erected around the enclave of West Berlin, lasting until Hungary's removal of border controls in August 1989 led to the migration of East Germans through Czechoslovakia. The Wall fell in November, and after March 1990 elections in the East the winning coalition backed speedy reunification, with its Lander incorporated in the Federal Republic. A town planning student at South Bank Polytechnic, 21-year-old Graham Whiteley in 1971 joined a Light Railway Transport League study tour from 2 to 18 July on his first trip abroad. In the UK this was the year of decimalisation and the Morris Marina, when inflation reached a 30-year high of 8.6% and education secretary Margaret Thatcher abolished free school milk. Reached by rail and the comfortable BR ferry TS Avalon from Harwich to the Hook of Holland where former Manchester-Sheffield electric locomotive Aurora hauled their train, the tour visited one-third of East Germany's 29 tramway systems of which only 2 have since closed while 2 others are now heritage operations. The East German landscape was of bombed cities, many of whose cathedrals, schlosses and town halls would receive only cosmetic repairs until the 1990s - all but one of the bridges across the Elbe in Dresden had been blown up by the SS on the war's second last day so as to delay the Red Army's advance. Trabants and Skodas were the only cars on the streets, which had a conspicuous lack of advertising, but television aerials were tall so as to pick up Western channels. Steam locomotives were still in widespread use, and strange sights included a water lorry and ladies in the street loading a pile of lignite into buckets. The suburban landscape of nondescript architecture contrasted with the utopian socialist planning of city centres, relieved only by pedestrian precincts and water features, flags and banners proclaiming Communist slogans and, this being Germany, beer gardens provided welcome relief from the visual austerity. The traditional German tram was a four-wheeled two-axle motor car pulling one or two trailers. Gauge almost always was either metre or standard. Wartime losses had led to a fleet renewal, and eventually the 1930s US-designed technically advanced "PCC" streetcar, aimed at winning back motorists, was adopted by CKD Tatra of Prague for Eastern European tramways in the mid-1960s, resulting in the phenomenally successful four-axle T3 type, translated into the narrower T4D for East German applications. PCC cars used, in particular, resilient wheel construction with rubber inserts and hypoid gearing, giving a very quiet and smooth ride. When the Communist bloc's Common Market equivalent COMECON decreed that all tram production should be centralised at their plant in Prague, the Gotha works in East Germany ceased production in 1965, although a fleet of two-axle cars was produced subsequently by the local Riechsbahn factory. In West Berlin trams had been replaced by the U-bahn in 1967, but East Berlin's S-bahn no longer called at stations in the West. Buildings in the East were generally less modern with the notable exception of the 1207-foot Fernsehturm television tower completed in 1969 which was topped by a sphere reminiscent of the Soviet sputnik. However sunlight reflecting from its panels created a nearly perfect Greek cross, visible throughout the divided city which West Berliners quickly dubbed the "Pope's Revenge" as divine retaliation for the government's removal of crosses from East Berlin's churches. 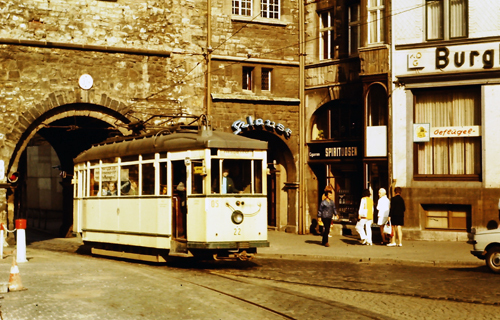 Unlike British cities, East German ones were into the preservation of historic trams, and trolleybuses sometimes pulling trailers were widespread from the post-war years until the 1970s, with Dresden having an orbital route that until 1975 linked its tram lines which have since lost their rural outliers. Trams ran out from cities to forests and industrial locations in the surrounding countryside, but an international tram line from Frankfurt Oder across the new frontier into Poland had already closed. Curiosities encountered included an electric ferry across the Straussee, the Dresden Suspension Railway - a funicular climbing 84 metres in its 271-metre length that was designed by the creator of the better-known Schwebebahn in Wuppertal - industrial railways run as part of the tram networks with electric or fireless locomotives, Young Pioneers operating a steam paddle-steamer on the Elbe and a miniature railway modelled on the Romney Hythe & Dymchurch. Amongst other delights, the Dresden Transport Museum has a 60cm Fairlie-like Pechot-Bourdon articulated loco, built for the Western Front by Baldwin in 1916. A 560km network of 75cm gauge lines had developed in Saxony, with standard-gauge freight hauled on 'rollwagens' and busy commuter and leisure services, latterly mainly hauled by pre- or post-war 2-10-2 tanks or the iconic Saxon-Meyer articulated locomotives on both roadside and cross-country routes. Leipzig had a heritage tram and a crane-car but a distinct lack of waiting shelters, while Karl Marx Stadt previously and again now known as Chemnitz was in the throes of converting its non-standard 925 mm lines to metre until it decided to go for standard-gauge. Eisenach where the BMW plant had had to change its name to EMW was the only city visited to lose its trams, a metre-gauge network closing in 1975 but the route through the St Nicholas Gate is still visible, and Erfurt's was modernised into a light-rail system. Owing to its financial position the DR was prone to closing narrow-gauge railways as their assets came up for renewal - they had declined to only 86km by unification on some half-dozen routes, but under various guises these survive today - and it was probably reunification that saved the other tram networks visited by providing the necessary investment in the 1990s when many cities in the former East experienced population losses of up to 30%. Photography was possible whether with the approval of the tour's minders or while no-one was looking. Graham's slides have retained their colour, and he wonders whether in 46 years' time we shall be so easily able to view pictures taken on today's smartphones and digital cameras. The Scottish Region thanks him for putting together a presentation, many of whose images had never before been shown in public.